Newsgur USA: Middle East and the United States, a conflict without end? Middle East and the United States, a conflict without end? The Guta Oriental, one of the fronts of the conflict has been bombarded intensely by the regime since Monday. According to the OSDH, 22 civilians, including two children, died. In new bombings against this region, where some 400,000 people have been besieged since 2013, dozens of civilians were injured on Thursday. Six locations were besieged by airstrikes on Thursday. Jisrin was one of them. There a man carried his wounded daughter in his arms and threw himself on a civil defense ambulance; a woman was found under the rubble; the bodies of two girls lay on the ground, lifeless. In Damascus, two civilians were killed by mortar fire in response to the rebels, according to the official Sana news agency. On the diplomatic level, due to the chaos, the UN Security Council agreed to a closed-door meeting to agree on a one-month humanitarian truce requested by representatives of UN agencies based in Damascus. More than a hundred fighters of the pro-Syrian government are the estimated number of deaths by the military side of the United States, after the revenge attack executed on Thursday. The attack was triggered by a rise in tension between Washington and Damascus over the alleged use of chemical weapons by the Syrian regime and an associated militia. Forces loyal to President Bashar al-Assad began the attack at a key oil and gas facility in the province of Deir Ezzor, an area controlled by Kurdish forces preserved by Washington. According to the Syrian Observatory of Human Rights, planes of the Assad regime returned to attack the rebel enclave of Guta Oriental, outside Damascus, for the fourth consecutive day, where the death toll has risen to 171, since Monday. CENTCOM says that there were coalition advisors in the area attacked by pro-government forces in Deir Ezzor, of the US military command in the Middle East, on Wednesday night. A military commander of the Syrian Democratic Forces (SDF) stated that the association carried out bombings against the aggressor forces so as not to challenge the assault committed against its personnel by the combatants with whom they collaborate. The same source estimated an approximate of more than 100 members, fighters of the pro-regime Syrian forces lost their lives in the confrontation with the Syrian Democratic Forces and the forces of the association. The initial attack occurred near Jasham and only 45 deaths were confirmed among pro-regime forces. According to the director of the OSDH, Rami Abdel Rahman, based in the United Kingdom, said that the intention of the attack was to capture a large gas plant and a key oil field in an area monitored by the SDS. Prior to the war, Omar oil field production, recognized as one of the largest in Syria, was 30,000 barrels per day and the gas field in Conoco was 13 million cubic meters per day. The Syrian press confirmed the deaths of dozens of civilians in the clashes, however, they denied the loss of regime soldiers, because they named victims as popular forces. 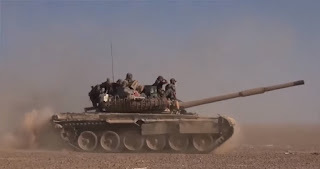 The attack occurred eight kilometers east of the line of jurisdiction set by Russia and the United States along the Euphrates, where Russian forces maneuver to the west and US forces to the east.